What is the all on 4 treatment? Dr. Xochipilli Bojorquez is the mexican leading expert in the All on 4 Treatment with over one-hundred successful procedures, but what does this procedure entail? And how is she improving the dental health of folks worldwide? Well, the All on 4 dental treatments is a full mouth reconstruction solution for those people with denture or decaying dentition who don’t want the hassle of having removable dentures. Traditionally a dentist had to insert at least 8 implants along the mouth to support a bridge that could replace the denture. Even though the process is excellent, and most patient can tell you success stories, it’s also true that it was a long surgery and could cause some discomfort for the first few days. Dr. Paulo Malo in cooperation with the leading prosthetics manufacturer, Nobel Biocare, came up with this new method which could affix a bridge with as few as 4 dental implants, making the procedure a lot faster and minimizing the need for complex surgery such as bone grafting. With the All on 4 treatments the dentist removes the remaining teeth and places two implants in the frontal side of the jaw, and two angled toward the back of the mouth avoiding the maxillary sinus and the nerve canal. With the implants in place a bridge is fixed and the prosthetics are placed, at the first the teeth are usually made of acrylic while the jaw heals, considering that there is no prosthetic near the pallet this gives the patient a very natural feel inside their mouth. Once enough time has passed, a new denture is made of more durable materials such as ceramic supported by a titanium frame, giving it an extremely natural look with a tremendous strength. 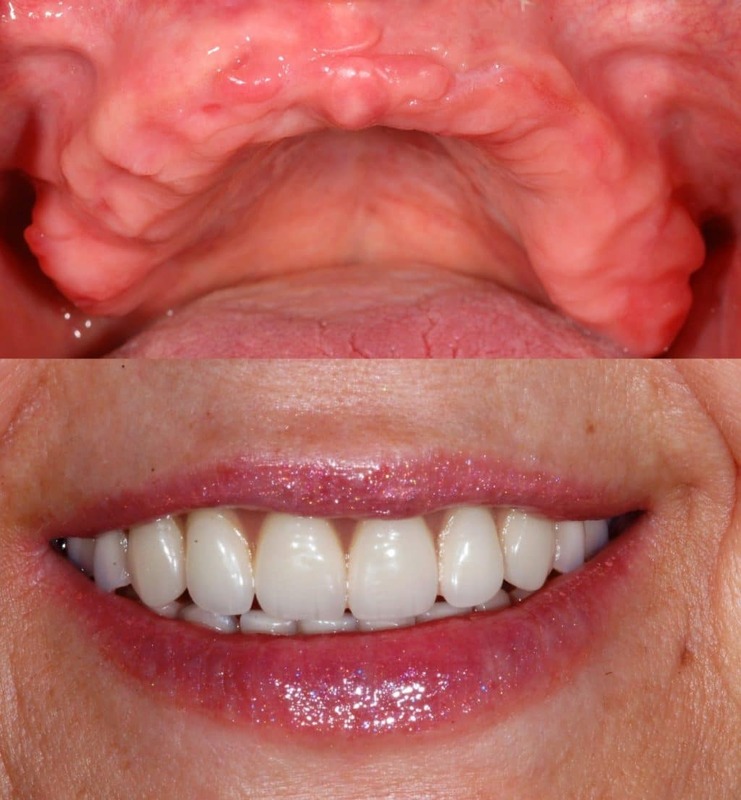 Pink Gingiva is used to give the top of the prosthetic that natural pink-like color of healthy gums. One of the greatest benefits of the all on 4 treatment is that the patient can do things that would prove impossible or extremely uncomfortable with removable dentures, such as eating hard food, chewing bubblegum, playing musical instruments or eating popcorn, given enough time, you might even forget that you have a dental replacement in the first place. The latest research proves that the procedure can last for a very long time without needing replacement (the average success rate is 94% in a 10 year span), and it’s about 1/3 the price of similar procedures, making it a very viable option if you are looking for that perfect smile. If anything you’ve read so far speaks to you, just give Los Algodones a call, we have a staff ready to take any calls and guide you through this process, we want you to make the best choice for your needs so you can get the dental health and aesthetics you desire.